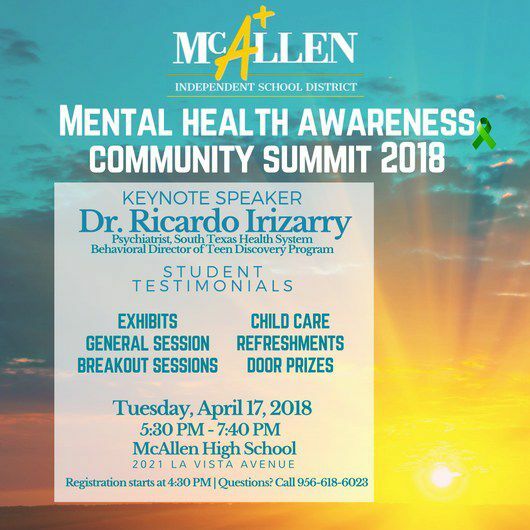 McAllen school district officials are hosting a Mental Health Awareness Community Summit this evening. The summit, which will be free to the public, will take place at McAllen High School, located at 2021 La Vista Ave., from 5:30 to 7:30 p.m. Topics such as parenting style, dealing with anger and stress management through a series of exhibits, general sessions and breakout sessions will be stressed. Dr. Ricardo Irizarry, psychiatrist and behavioral director of teen discovery program at South Texas Health System, will be the keynote speaker. Registration for the event starts at 4:30 p.m. For more information, contact school district officials at (956) 618-6023.